“air+electricity” examines these two effective media that form the essence of digital and new media art. The undeniable physicality and immediacy of light and sound amplification is realized in this performance – exploring the relation between the physical and immersive nature of light and sound. The technology over technique argument is examined as old and “obsolete” technologies are informed and enlightened by the concepts of the digital age. The mutability of forms, the transformation and filtering of content – the sensibilities of new media, expanded cinema, virtual/digital art are reapplied to the surfaces and spaces from which they came – reactivating existing spaces by moving from the screen and the soundcard to the very room itself through the direct and unmediated deployment of the elements constituting the projection and sound: space, time, texture and form. 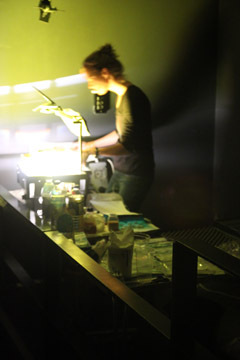 Overhead projectionist Katrin Bethge works directly upon the surface of the projector: from still images and overlaid objects, to using substances such as sand, food-materials, oil and water applied to these surfaces in glass basins upon the surface of combinations of projectors .The realtime development of the visual material is paired with the work of sound artist Robert Curgenven who explores the harmonics of the performance space via custom dubplates, turntables, fans and contact mics to manipulate the roomtone in realtime via harmonic feedback. This is underscored by minutely detailed field recordings from Australia’s remotest regions, employing an emphasis on real sounds suffused within a surreal post-architectural expansion of space. Robert Curgenven (1974) suffuses immense fields of constantly shifting sound with an elegant tactility and mesmerizing detail. His compelling work spans immersive resonances created with turntables and custom-made vinyl, instrumental harmonics and guitar feedback to carefully detailed field recordings from remote areas in which he lived for many years. Curgenven has performed throughout Australia and Europe, including Club Transmediale , Ultrahang Festival (Budapest), Gallery for Contemporary Art (Leipzig), Feste dell Acqua (Vicenza), C/O Pop (Koln), Alice Springs Desert Festival and Darwin Festival. He has presented sound installations at Transmediale (Berlin), 10 Years of Microsound (Diapason Gallery, New York), galleries throughout Australia, Italy, France, Poland, UK and Germany. 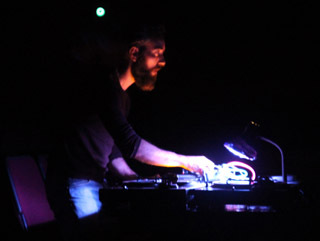 His 2010 album, “Oltre”, a documentation of two months of live concerts across Europe in 2009, was announced by Boomkat as “The best LINE/12K release in ages”. air+electricity has performed widely across Europe, including Laznia Centre for Contemporary Art (Gdansk), Nachtstrom (Basel), Mikro_Makro festival (Slupsk), Radial System V (Berlin), Die Remise Sommercamp (Maria am Ostbahnhof, Berlin), Skam Gallery and Kultwerk (Hamburg) and Lothringer (Munich). Takahashi’s Shellfish Concern combines abstract expressionist visual art with experimental electronic-acoustic music to accentuate the similarities of both during improvised exchanges. We hope to facilitate an event in which the audience is prompted to consider this merger of music and art as a single expression. The visual information functions in the space sound has traditionally functioned during instrumental exchanges. Further reinforcing the aural/visual relationship, the canvas is miked, and its sounds are the sole sound source that the musicians may utilize [/manipulate]. This effectively transforms the canvas surface into an instrument, as well as a sound gateway. Angela Guyton is a Colombian-American artist from Miami now living in Manchester, England. She explores mark-making and sound in combination, within the context of live improvised performance, and performs regularly in her performance art group, Takahashi’s Shellfish Concern. TSC is comprised of herself and two other musicians: Rodrigo Constanzo and Anton Hunter. 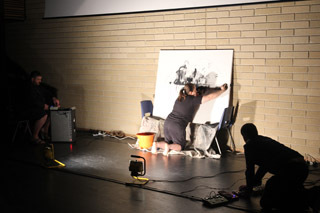 Angela and Rodrigo have been performing together, exploring interdisciplinary performance, since late 2004. Anton Hunter joined the duo when they moved to the UK in 2007. Angela is currently pursuing a MA in Contemporary Fine Art from the University of Salford, and Rodrigo is currently pursing a MA in Electro-Acoustic Composition at The University of Manchester. This generative, audiovisual work is based on a modified Lorenz attractor, a three-dimensional dynamical system and a model of atmospheric convection. It is implemented in the programming environment Max/MSP/Jitter and during performance, parameters are modified in real-time. The work as a virtuality, describable through its differential equations alone, is a model of natural-world phenomena that is completely deterministic. In theory, the same performance can be re-actualised by reproducing the same parameters and adjustments unlike many works based on genetic algorithms or stochastics. However, it is sensitive to initial conditions and seemingly insignificant deviations produce widely and unpredictably differing results; after all, it was through this attractor that the phrase the “butterfly effect” was coined where a butterfly beating its wings may eventually result in a hurricane, but also due to the attractor’s lemniscate-shape. These parameters form a non-linear, multi-dimensional plane, or a manifold in itself, and as such, possibilities of controlling or learning to “play” the piece can be limited and illusory. A diverse variety of behaviours are observed, ranging from periodicity to chaos. These yield interesting results as audio, either as signal data in nonstandard synthesis or control data such as rhythm, pitch and panning (no pre-recorded samples or conventional oscillators are used apart from sine waves), and as 3D-visuals. Nonetheless, the two domains do not remain mere mirror images of each other due to independent emergent phenomena arising from the system’s inherent complexity. Ryo Ikeshiro is an electronic and acoustic musician working in the fields of audiovisual composition, improvisation, interactive installations and soundtracks. He gained a 1st Class in BMus (Hons) from Kings College London, and later a MPhil in composition at Cambridge. He is currently studying for a PhD in studio composition at Goldsmiths College. Research interests include the use of chaotic systems in generative, emergent structures and nonstandard synthesis, punk aesthetics in electronic music and new forms of interaction and presentation of works. Recent projects include: presentation of the paper “GENDYN and Merzbow” at Xenakis International Symposium 2011, London; performance of the generative work Construction in Self and presentation of the accompanying paper “Generative, Emergent, Self-Similar Structures: Construction in Self” at ICMC10, New York; PulseCubes, an interactive sound installation at re:new 2010, Copenhagen; and David Tudor’s Rainforest IV, London. He is a member of ry-om, whose tracks have been featured on Resonance FM; their recent studio project was for Creative Sources Recordings. His orchestral works have been performed by the Britten Sinfonia. As an events organiser, he has started a series entitled ABA where a performance of a work is proceeded by a talk and a discussion with the composer, followed by a second performance of the same piece. Hydro-Acoustic Study is a live cinematic exploration of sonically activated hydrological events, specifically evolving waveforms, proto-cellular bubbles, and meniscus’s that grow and exhibit behaviour in direct response to sound. Within this simulated rheological environment a hydro-graphic narrative unfolds orchestrated by sound as an organising principle and nourishing substance. The work takes inspiration from a number of scientific studies in the cymatic properties of water. 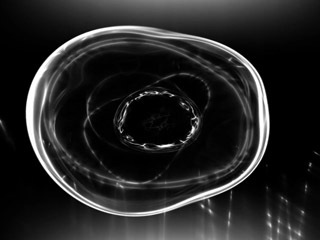 It attempts a speculative inquiry into future possibilities in the study of the effects of sonic frequencies on water. This piece was originally commissioned by Optofonica Lab, Amsterdam as a collaborative piece with the sound artist Francisco Lopez. It has subsequently been developed as a standalone. Hydro-Acoustic Study uses a variety of techniques to translate sound directly into visual material – from real-time algorithmic sound analysis methods, such as beat detection and frequency analysis, to direct translation of generative sound mapping to the visual output via OSC (Open Sound Control) and MIDI data transmission. 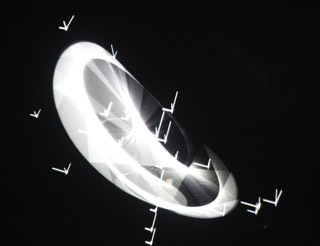 Paul Prudence is a audio-visual performer and installation artist working with computational, algorithmic and generative environments. 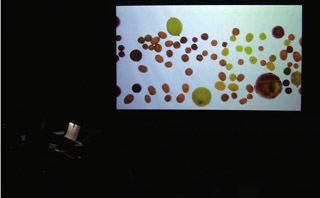 His work, which had been shown internationally, focuses on the ways in which sound, space and form can be cross wired to create live-cinematic visual-music experiences. He is also interested in data visualisation techniques, process-based environments and emergent systems. Paul maintains the research weblog Dataisnature in which he writes about the interrelationships between natural processes, computational systems and procedural-based art practices. Dataisnature has been used on a number of academic course syllabus’s worldwide. Paul has given lectures and workshops to a wide range of audiences and venues – from BA and MFA students to art-science conferences and through to digital arts festivals. He has presented his personal work and his inter-media research at venues such as The Royal Institution and The Science Museum in London, The School of Visual Arts in New York City, and a number of academic institutions in the UK and Holland. The art of Piet Mondrian (1872-1944) is known for its pure abstraction and ultimate simplicity. It seems so close to music that the artist himself described it with such terms as counterpoint, rhythm, syncopation or harmony. Inspired by musical variation form the video transforms, deconstructs and reconstructs five of Mondrian’s paintings in three movements: Moderato, Lento and Boogie-Woogie. Fruits and music have a lot in common. Both can be geometric and bright-colored but even when arranged in formal compositions they are never truly abstract. Anchored in visceral sensations, they can evoke emotions or associations of taste and smell. Even the simplest melodies or commonest of berries can make strong impressions. At times, both can be sensuous and juicy. The installation/performance is a search for traces of Chopin’s music in minds and faces of people from around the world. To carry it out Kapuscinski performed personal concerts for nearly 150 volunteers in places where Chopin is very popular but where he never set foot: Tokyo, San Francisco, Wellington, Sydney, Seoul, Beijing, Istanbul, Jerusalem, Helsinki, Buenos Aires, Santiago and Mexico City. The work is a re-composition of video documentations from these encounters and of Chopin’s Preludes op.28. Jaroslaw Kapuscinski is an intermedia composer and pianist whose work has been presented at New York’s MOMA, ZKM in Karlsruhe, Museums of Modern Art Palais de Tokyo and Centre Pompidou in Paris, National Reina Sofia Museum in Madrid and many other venues. He has received awards among others at the UNESCO Film sur l’art Festival in Paris (1992), VideoArt Festival in Locarno (1993, 1994) and Festival of New Cinema and New Media in Montréal (2000). Kapuscinski graduated from Academy of Music in Warsaw and University of California, San Diego. Currently he is Assistant Professor of composition at Stanford University. John Edmark teaches design, color theory, and animation in the Department of Art & Art History at Stanford University. His creative investigations range from organically inspired kinetic works and transformable objects, to products for storage, kitchen, and creative play. Previously, he researched 3-D virtual environments at Bell Laboratories. He has a Masters degrees in Product Design (Stanford), and Computer Science (Columbia). He is named inventor on nine U.S. utility patents. Other interests include hyper-stereo landscape photography, ultra-light backpacking, English country dancing, and throat singing. Chasing Waves is an audio visual performance based on analog recordings made in the Experimental Television Studio. Simple tones, buzzes and glitches were made visual using voltage controlled video synthesis and commited to miniDV. Using a proprietary program written in Max/Msp three to four video files, drawn from over 30 hours of recordings, are remixed live into a 30/40 minute performance, with each video played back on a separate part of the screen. When a number of these recordings are juxtaposed, complete with audio, new rhythmic and harmonic, audio visual complexities emerge. The program allows the playback of any file, in any screen position at variable tempo/ pitch. Material can be looped, pitched dynamically, triggered from any playback position, offering a wide range of performance possibilities and variation. Paul O Donoghue aka Ocusonic is an Irish composer/ audio visual artist based in Dublin, Ireland. He has released music under a number of pseudonyms for a variety of labels and produced music for television and radio. To date his audio visual work has screened internationally in more than 140 festivals and galleries in over 40 countries. 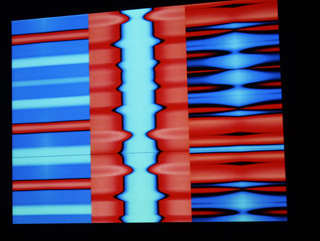 His current work is entirely audio visual and explores a disparate collection of methods and techniques for the creation of visual music. Underpinning all of these disciplines is Ocusonics, the real-time generation of synchronous audio and visual material. The work as a virtuality, describable through its differential equations alone, is a model of natural-world phenomena that is completely deterministic. In theory, the same performance can be re-actualised by reproducing the same parameters and adjustments unlike many works based on genetic algorithms or stochastics/probabilities. However, it is sensitive to initial conditions and seemingly insignificant deviations produce widely and unpredictably differing results; after all, it was through this attractor that the phrase the “butterfly effect” was coined where a butterfly beating its wings may eventually result in a hurricane, but also due to the attractor’s lemniscate-shape. These parameters form a non-linear, multi-dimensional plane or a manifold, and as such, possibilities of controlling or learning to “play” the piece can be limited and illusory. A diverse variety of behaviours are observed, ranging from periodicity to chaos. These yield interesting results as audio, either as signal data in nonstandard synthesis or control data such as rhythm, pitch and panning (no pre-recorded samples or conventional oscillators are used apart from sine waves), and as 3D visuals. Nonetheless, the two domains do not remain mere mirror images of each other due to independent emergent phenomena arising from the system’s inherent complexity and audiovisualisation methods. Recent projects include: presentation of the paper “GENDYN and Merzbow” at Xenakis International Symposium 2011, London; performance of the generative work Construction in Self at “Japan 2011” at CONTEMPORANEA 2011 Festival di Nuova Musica, Udine and at ICMC10, New York along with presentation of the accompanying paper “Generative, Emergent, Self-Similar Structures: Construction in Self”; PulseCubes, an interactive sound installation at re:new 2010, Copenhagen; and David Tudor?s Rainforest IV, London. He is a member of ry-om, whose tracks have been featured on Resonance FM; their recent studio project was for Creative Sources Recordings. His orchestral works have been performed by the Britten Sinfonia. As an events organiser, he runs a series entitled ABA. He is also a visiting tutor and runs workshops challenging preconceptions about music. Katrin Bethge (1970) is a freelance illustrator and projection artist, working since 1999 with the staging virtual spaces of light and projection. Her overhead projections have accompanied projects in the fields of dance, theatre, music, photo exhibitions and actions in urban space. She has worked internationally including with dance performances at Kunsthaus and Kampnagel in Hamburg as well as on the HafenSafari in the port of Hamburg and produced audiovisual concerts with music by electro-acoustics and classical instrumentation.